We review the scientific literature, especially from the past decade, on the impacts of human activities on the Antarctic environment. A range of impacts has been identified at a variety of spatial and temporal scales. Chemical contamination and sewage disposal on the continent have been found to be long-lived. Contemporary sewage management practices at many coastal stations are insufficient to prevent local contamination but no introduction of non-indigenous organisms through this route has yet been demonstrated. Human activities, particularly construction and transport, have led to disturbances of flora and fauna. 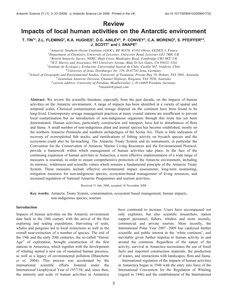 A small number of non-indigenous plant and animal species has become established, mostly on the northern Antarctic Peninsula and southern archipelagos of the Scotia Arc. There is little indication of recovery of overexploited fish stocks, and ramifications of fishing activity on bycatch species and the ecosystem could also be far-reaching. The Antarctic Treaty System and its instruments, in particular the Convention for the Conservation of Antarctic Marine Living Resources and the Environmental Protocol, provide a framework within which management of human activities take place. In the face of the continuing expansion of human activities in Antarctica, a more effective implementation of a wide range of measures is essential, in order to ensure comprehensive protection of the Antarctic environment, including its intrinsic, wilderness and scientific values which remains a fundamental principle of the Antarctic Treaty System. These measures include effective environmental impact assessments, long-term monitoring, mitigation measures for non-indigenous species, ecosystem-based management of living resources, and increased regulation of National Antarctic Programmes and tourism activities.